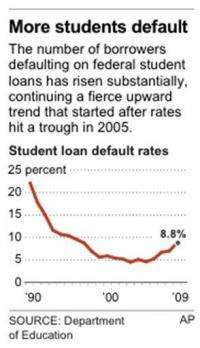 Graphic charts federal student loan default rates since 1990. Of the approximately 1 million student borrowers at for-profit schools whose first payments came due in the year starting Oct. 1, 2008 - at the peak of the financial crisis - 15 percent were already at least 270 days behind in their payments two years later. That was an increase from 11.6 percent last year. The federal default rate remains substantially below its peak of more than 20 percent in the early 1990s, before a series of reforms in government lending. But after years of steady declines it has now risen four straight years to its highest rate since 1997, and is nearly double its trough of 4.6 percent in 2005. Troubling as the new figures are, they understate how many students will eventually default. Last year's two-year default rate increased to more than 12 percent when the government made preliminary calculations of how many defaulted within three years. Beginning next year, the department will begin using the figure for how many default within three years to determine which institutions will lose eligibility to enroll students receiving government financial aid. The figures come as a stalled economy is hitting student borrowers from two sides - forcing cash-strapped state institutions to raise tuition, and making it harder for graduates to find jobs. The unemployment rate of 4.3 percent for college graduates remains substantially lower than for those without a degree. But many student borrowers don't finish the degree they borrow to pay for. The Department of Education has begun an income-based repayment plan that caps federal loan payments at 15 percent of discretionary income. And new regulations the Obama administration has imposed on the for-profit sector have prompted those so-called proprietary colleges to close failing programs and tighten enrollment. Both developments could help lower default rates in the future. Administration officials took pains to praise the for-profit sector for recent reforms, but also said flatly that those schools - along with the weak economy - are largely to blame for the current increases. Among some of the largest and better-known operators, the default rate at the University of Phoenix chain rose from 12.8 to 18.8 percent and at ITT Technical Institute it jumped from 10.9 percent to 22.6 percent. "We are disappointed to see increases in the cohort default rates for our students, as well as students in other sectors of higher education," said Brian Moran, interim president and CEO of APSCU, the Association of Private Sector Colleges and Universities, which represents the for-profit sector. He said for-profit schools were taking remedial steps, including debt counseling for students, to bring down the rates. "We believe that the default rates will go down when the economy improves and the unemployment rate drops," he said. Officials for Phoenix, owned by Apollo Group, Inc., and ITT, owned by ITT Educational Services, did not immediately respond to requests for comment. The department emphasized that it eventually manages to collect most of the money it's owed, even from defaulters. But that's part of the reason federal student loan defaults are so hard on borrowers - they can't be discharged in bankruptcy. Defaulting can also wreck students' credit and keep them from being able to return to school later with federal aid. "There are very few avenues for escaping that," Cochrane said. Also, "many employers these days are starting to check credit so it can hurt your job prospects." Very little demand for "new" skills in technology. Mostly all they do is re-invent the wheel, or add or remove features or bells and whistles. Don't need droves of people with programming or networking degrees. Hell, networking is simpler than ever actually. We've got too damn many operating systems and "competing" notepad clones as it is. if not for 10 companies re-inventing the wheel, unemployment would be even worse, however, as there'd be only about 1/5th as many jobs or so, since you'd have even fewer engineers and programmers needed. This just goes to show how the existing capitalism and currency scam known as the "free" market is actually one of the least efficient economic models possible. Look at all the time and money that was wasted training so many people in 2 year and 4 year degrees for majors in jobs that never existed, and will never exist. Not only was it a waste of Federal resources in the form of money, it was a waste of collective and individual efforts, and the individuals come away from their "education" experience having gained nothing, and left with a net loss for their troubles. Once you've established a brand and have a working product model, such as any given smart phone, the company doesn't need a complete re-design every time they update the product. This means fewer engineering jobs both in software and hardware. The smartphone companies buy most of their parts from china, japan, and taiwan anwyay. They just design the "system", but the components come from some place else, usually. Either way, the different brands are often useless middle-men copycats of one or two competing innovators. As stated, the jobs crisis is unfixable, because labor simply isn't needed any more, nor is engineering or software design needed any more. Population has plateaued, so it's not like you need "new" houses, schools, or infrastructure, you just need to maintain what you have. Technology is mostly the same old thing just miniaturized. Software is the same as it has been. Add a feature here, remove one there, don't need a million gurus to do that, one or two guys on part time can handle it. So where are teh "jobs"? Well, they are being done by robots and computers, of course, and about ten times more could be automated if the world was fair and rational, which is a good thing, or rather would be if we lived in a fair and rational world. Unfortunately, we don't. We live in a world where governments and the wealthy use personal income as a slavery mechanism, and so if you don't have a "job" you can't do anything anyway. Extremely advanced technology could and would eventually make "money" obsolete in a fair and rational world, because all work would be done either by machines or "volunteers", such as in Star Trek, where everyone shares everything, and they pretty much just work to maintain and advance their technology. Why would money matter if everything is "free" in terms of human costs, and you only work at your own pace, or when there is a crisis anyway? Nobody would need money, for example, if everything was made by solar powered robots, and resources were gathered by solar powered robots so the "costs" would all be zero. While we aren't there yet, because of people's narrow mindedness, tradition, and control mechanisms, the fact is we are eventually transisioning to an automation-based society. "Work" will not exist when computers do everything. Nano, when will automation diagnose and treat your ailments, build your housing, service your vehicle or fix your heating/cooling system? You need to get out of the office a little more and choose to be more observant. When I inquired about higher education I was deluged with high pressure sales tactics to sign up for Student Loans despite making it clear that I had absolutely no intention of applying for loans. The question that has been on my mind has always been " What is the kickback for these guys, anyway?". Higher Education has, IMNSHO, become more of a path to indentured servitude than gainfull employment while realization of personal potential. What good is making an extra 40 grand when you'll pay back 50-60 for what seems like half a lifetime? While programmers and engeneers are losing their jobs to outsourcing or H1-B visas, carpenters etc. aren't. bill clinton's fault. why you ask? he made studen loans NON-dischargeable in bankruptcy when prior to him , they were just like credit card debt in a bankruptcy AND he backstopped private lenders risk with government guarantees of payment. he set up a situation where debtors get screwed AND more importantly, where lenders' cannot lose. the ONLY solution to this problem that will be effective within a 4 year time frame is to change the law and allow these loans to be discharged in bankruptcy. simple truth. hard to swallow. all other arguments are put forth in 'research papers' paid for by creditor's associations in america. or lawyers. lets say you are a student - and you are at the end of your junior year -- you own nothing, you don;t really make much money, but you have borrowed 35k or you are finishing your MS or Ph.d next semester and you are 130k in the hole before getting a job -- you could that last semester file bankruptcy and get it all cleared and come out and then get a job with out ever paying back the society that put you through school. Nano, when will automation diagnose and treat your ailments, build your housing, service your vehicle or fix your heating/cooling system. I'd say conservatively that within 50 years ALL of that will be not only doable, but much cheaper and much more efficient than existing hands on methods. Some of that will be doable within 25 years, easily. There is more research and development going into self-maintaining systems and self-repairing materials. Nanotechnology and self-maintaining systems will mean you won't need to service appliances. They will clean and maintain themselves, and in some cases even repair themselves. You might think I'm nuts, but so what? 25 years ago camera phones and smartphones were the stuff of science fiction (forbidden planet, Star Trek, etc,) and then 15 years ago they were sort of a high school "What if" joke. Today they are real, and in some ways better than the science fiction imagined.